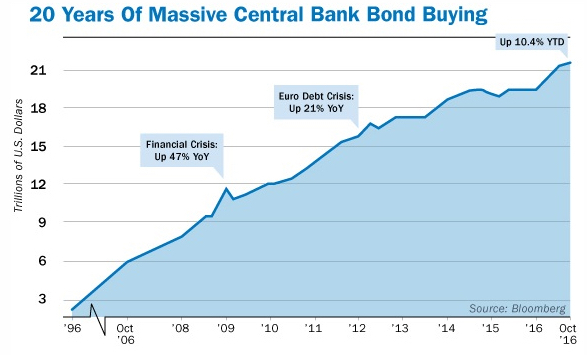 The massive injection of fiat credit has drastically falsified prices in the debt and money markets. Through the channels of cap rates, carry trades and corporate financial engineering, the prices of equities and all other risk assets, have been falsified too. Bond and stock prices are way too high, and that reality has infected the very foundations of the financial system. Like the hapless Chuck Prince last time, today’s traders and robo-machines have lost all contact with the fundamentals of corporate performance, macroeconomic outlooks and the political risks of a Washington. Traders today are just dancing – blindly. That’s why the Russell 2000 hit 1442 the other day, capitalizing the earnings of small and mid-cap domestic companies at 87.5 times. That’s crazy in its own right. As measured by valued added output of the U.S. business sector, the main street economy – where most of these companies live — has expanded at a tepid 2.1% annual rate since 2002. By contrast, the RUT index has increased by 10% per annum since then. At the same time, the level of speculation in the hyper-momentum tech stocks is even more stunning. We are in the blow-off stage of the Fed’s third and greatest bubble of this century. Yet the stock market has narrowed drastically during the last thirty months, as is typical of a speculative mania. This narrowing means that the price-earnings ratio (PE) among the handful of big winners have soared. In the case of the so-called “FAANGs + M” (Facebook, Apple, Amazon, Netflix, Google and Microsoft), the group’s weighted average PE multiple has increased by 50%. That’s caused the market cap of these six super-momentum stocks to soar from $1.7 trillion to $3.1 trillion during the period or by 82%. The combined earnings of the group have grown by just 20%. 75% of this huge gain in market cap is attributable to multiple expansion, not operating performance. The degree to which the casino’s speculative mania has been concentrated in the FAANGs + M can also be seen by contrasting them with the other 494 stocks in the S&P 500. The market cap of the index as a whole rose from $17.7 trillion in January 2015 to $21.2 trillion at present, meaning that the FAANGs + M account for 40% of the entire gain! If this concentrated gain in a handful of stocks sounds familiar that’s because this rodeo has been held before. The Four Horseman of Tech (Microsoft, Dell, Cisco and Intel) at the turn of the century saw their market cap soar from $850 billion to $1.65 trillion or by 94% during the manic months before the dotcom peak. At the March 2000 peak, Microsoft’s PE multiple was 60 times, Intel’s was 50 times and Cisco’s hit 200 times. Those nosebleed valuations were really not much different than Facebook today at 40, Amazon at 190 and Netflix at 217 times PE. The point is, even great companies do not escape drastic over-valuation during the blow-off stage of bubble peaks. That spectacular collapse was not due to a meltdown of their sales and profits. Like the FAANGs +M today, the Four Horseman were quasi-mature, big cap companies that never really stopped growing. For example, Cisco’s revenues have increased from $15 billion to $50 billion annually during the last 17 years and its net income has tripled to $10 billion. Yet Cisco’s market cap today is just $160 billion or only 30% of its 17-years ago bubble peak. The reason is PE normalization. In this case, the company’s hideously inflated 200 times PE multiple imploded with the tech crash. It now stands at 15 times PE. Amazon is now set for that kind of PE implosion during this cycle. It’s stock price doubled from $285 per share in January 2015 to $575 by October of that year; and then it doubled again to $1026 in the 20 months since. Along the way it picked up a hefty $350 billion in added market cap. That’s nearly $12 billion of value gain per month! Amazon is now 24 years-old, not a start-up; and it hasn’t invented anything explosively new like the iPhone or personal computer. Yes, it is taking retail market share by leaps and bounds, but that’s inherently a one-time gain that can’t be capitalized to infinity. Indeed, 91% of its sales involves sourcing, moving, storing and delivering goods — a sector of the economy that has grown by just 2.2% annually in nominal dollars for the last decade. 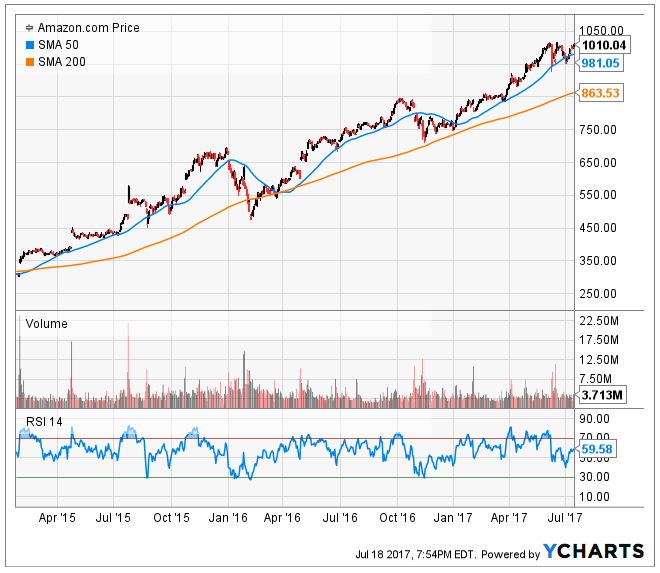 Amazon embodies the speculative mania of the current market. It is simply ludicrous to put a multiple of 190 times PE on a company that runs a profitless $130 billion e-Commerce sales juggernaut. Even as its stock price has tripled during the last 30 months, AMZN has experienced two sharp drawdowns of 28% and 12%, respectively. As shown in the first chart below, both times it plunged to its 200-day moving average in a matter of a few weeks. A similar drawdown to its 200-day moving average today would result in an immediate 16% sell-off. But when, not if, the broad market plunges into a long overdue correction the ultimate drop will exceed that by a greater magnitude. In the meanwhile, the market mindlessly melts-up because the Fed has destroyed all of Wall Street’s natural forces of financial discipline. Eight years of central bank money printing and intrusion have destroyed short-sellers and caused day-traders and robo-machines to be wired to buy every dip. Never mind about the gong show in Washington. Or even the fact that the Keynesian economists in the Fed’s Eccles Building does actually intend to normalize rates and shrink the Fed’s balance sheet. The talking heads wandering around Wall Street have come to the delusional belief that the bubble can live forever without help from Washington or the Fed. 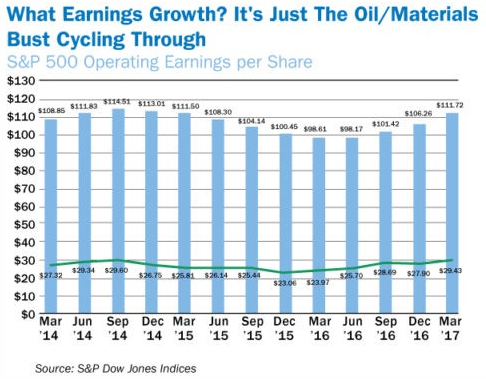 With only a small share of companies having reported, LTM earnings for the S&P 500 have already dropped below $105 per share on a GAAP basis. That’s still below the $106 per share posted way back in September 2014 and barely above the $100 per share reported in 2013. Make no mistake, this is the Chuck Prince Market Redux. Only the daredevils and Wall Street dancing machines would dare buy the S&P 500 at 25 times PE, the Russell 2000 at 88 times PE, Amazon at 190 times PE. For everyone else, the present blow-off top is surely a godsend. 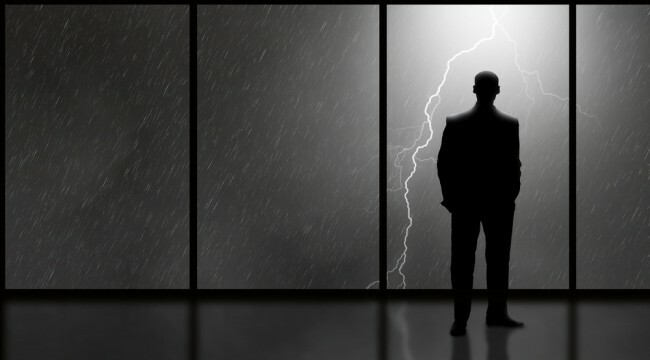 Never has there been a better opportunity to get out of harm’s way, nor a clearer warning that a thundering crash is waiting just around the bend.